Campaign Against Human Trafficking –SouthShore (CAHT) was recognized by PACE Center for Girls, Hillsborough, at their Legacy Luncheon held November 7th. CAHT was awarded PACE’s 2018 Community Partnership Recognition Plaque for their continued support of PACE through donations and tangible items and services for the PACE students over the past five years. “We are proud to recognize CAHT for their commitment to our organization in providing a safer world for our youth, which we find absolutely inspiring”, stated Tanya R. Hollins, regional Executive Director. PACE provides girls and young women with an opportunity for a better future through education, counseling, training and advocacy. Accepting the award was CAHT President Annie Garrison. 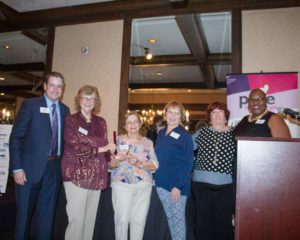 Photos: Rocky Brancato, Vice Chair, Pace Center for Girls, Hillsborough, CAHT President Annie Garrison, CAHT Board Members – Joan Kramer, Kathy Lippincott and Jean Harrison, Tanya R. Hollins, PACE Executive Director. And PACE Center for Girls Plaque awarded to CAHT. CAHT is a 501(c)(3) nonprofit located in Sun City Center, FL. , whose mission is to provide funding and tangible items to safe homes, rehabilitation centers, and other human trafficking organizations that are on the front line in the battle against human trafficking. CAHT also provides education and prevention programs to schools, churches, clubs, and healthcare organizations on human trafficking in the south shore area. For more information, contact Annie Garrison, 813-938-5660 or anngarrison66@gmail.com.